This classic Swiss chalet style lodge is located 10 miles inside Glacier National Park’s west entrance on the Going-to-the-Sun Road, nestled on the shores of the largest lake inside the park. Built in 1913, this historic lodge has a picturesque location on the eastern shore of beautiful Lake McDonald with 82 guest rooms split between the three-story main lodge, a row of cabins, Snyder Hall and the exquisite Cobb House. Main lodge rooms are located on the second and third floors. Large/small cabin rooms are located along a tree-lined pathway adjacent to the lodge. This location presents visitors with Russell’s Fireside Dining Room, Jammer Joe’s Grill and Pizzeria, Lucke’s Lounge, Creekside Reading Room, Red Bus tours, boat cruises, horseback rides, evening ranger programs and numerous other activities. 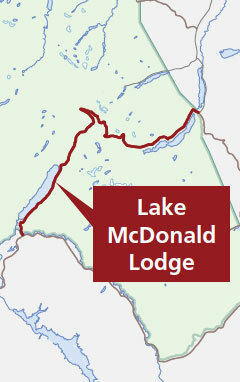 All guest rooms at Lake McDonald are rustic, yet comfortable. In keeping in the era in which all the rooms were built, they offer guests modest amenities but recent renovations have added some king and queen beds along with upscaling a number of rooms and cabins. Televisions (except for the suites), air conditioning and elevators are not available. Each cabin room shares a common wall, however, there are no connecting doors between cabins rooms. The Cobb House and Snyder Hall are both within walking distance of the main lodge. The Cobb House features three suites, each with a sitting area, private bathroom, one queen bed, sleeper sofa and flat-screen television. Snyder Hall, a converted historic dormitory, features eight hostel-style rooms, each with a double bed or twin bunk beds, in-room sink and access to a shared bathroom. A limited number of ADA-accessible rooms are available and booked based on availability. Only designated guide, service and/or hearing companion animals are allowed in the facilities. Guest rooms and hotel facilities are all non-smoking. All lodge rooms have a private bathroom and parking is available in the main lot. Renovated in 2015, standard and deluxe rooms are available with 1 or 2 queen beds. All cabin rooms share a common wall and most share a small entryway. There are no connecting doors between cabin rooms. All cabin rooms have a private bathroom and parking is usually available nearby. Renovated in 2015, smaller cabins have either 1 or 2 doubles or 1 queen, the larger deluxe cabins have 1 king or 1 queen bed, and a limited number of those deluxe cabins also have a sleeper sofa.